Oliver Giroud is a French professional footballer who plays as a forward for Premier League club Chelsea and the France national team. He wears shirt number 18 at Chelsea. The 32 years old professional started his youth career from Frogs in 1992 and has played professional football for several clubs like Grenoble, Tours, Montpellier, Istres, and Arsenal. He has won two FA Cups, one with Arsenal and another with Chelsea. He has also won FA Community Shield thrice with Arsenal and 2018 FIFA World Cup with France. His goal was awarded FIFA Puskas Award in 2017. His scorpion kick backheel volley goal against Crystal Palace on 1 January 2017, was awarded the 2017 FIFA Puskas Award. Olivier Giroud was born on September 30, 1986, in Chambéry, Savoie, France. He holds French nationality and his ethnicity is Italian and French. From the beginning of his childhood, he had a keen interest in football and also began to learn from the very early age. He was raised in Froges, where his started youth football. Moving towards his education, there is not any information regarding his educational background. Giroud started training at Grenoble's youth academy in 1999. Initially, he played amateur football there. Later in 2007, Giroud signed a professional contract with the club. Giroud received his first professional red card in March 2007 against Gueugnon. Grenoble loaned Giroud to French club Istres in 2007. Istres was then playing in the third division football in France. Giroud played at Istres for a season. Giroud returned to Grenoble. However, he did not get much playing time there and decided to leave. French club Tours signed Giroud on a three-year deal in May 2008. Giroud became the top scorer in the Ligue 2 and was named the National Union of Professional Footballers Ligue 2 Player of the Year in 2010. Giroud joined another French club Montpellier in 2010. Giroud scored the winning goal in the extra time against PSG in the Coupe de la Ligue to reach club's major final since 1993. Giroud finished the season as the club's top scorer at the end of the season. Giroud become top scorer with 21 goals and 9 assists when Montpellier won their first league title. In June 2012, Premier League club Arsenal signed Giroud on a long-term contract for a transfer fee reported to be around 12.4 million Euro. Giroud became Arsenal fans' favorite in a short period of time. Giroud won 2013-14, 2014-15, and 2016-17 FA Cup and 2014, 2015, and 2017 FA Community Shield with Arsenal. Giroud scored a scorpion kick backheel volley against Crystal Palace on 1 January 2017. Arsene Wenger described his goal as the greatest he had ever seen at the Emirates Stadium. That goal later earned Giroud the FIFA Puskas Award in 2017. Another Premier League club Chelsea signed Giroud on an 18-month deal for an undisclosed fee reported to be around $23 million in January 2018. Olivier Giroud made international debut for France national team in 2011. Giroud has represented France national team at UEFA Euro 2012 and 2016, FIFA World Cup 2014 and 2018. Giroud was awarded Bronze boot when he became the joint second-highest scorer in 2016 UEFA Euro Cup. Giroud was one of the key players of the France national team that won the 2018 FIFA World Cup in Russia. Giroud has scored a total of 32 goals for France national team till date. Olivier Giroud is married to Jennifer. They got married in 2011. The couple has a beautiful daughter together named Jade and a son named Evan. Jade was born in June 2013, whereas Evan was born in 2016. Giroud is Roman Catholic by religion. 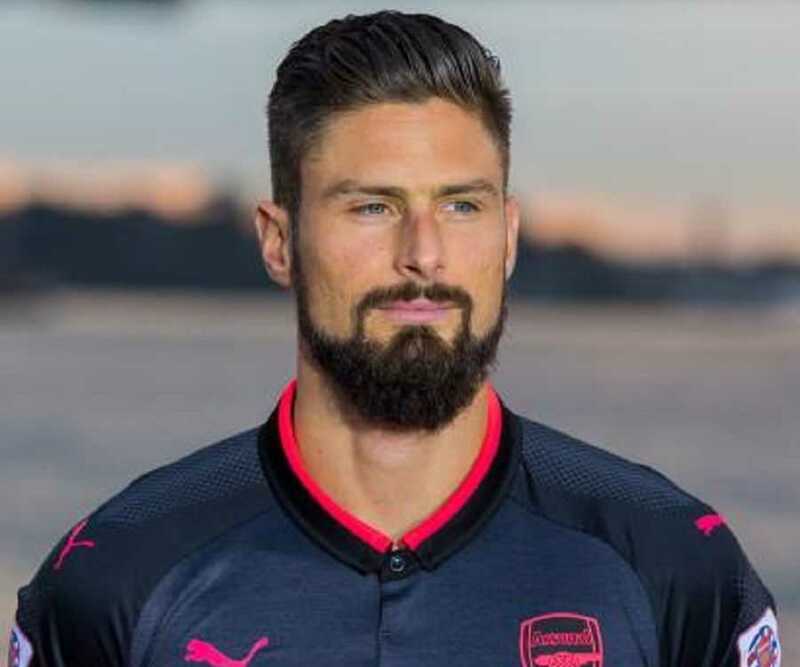 In February 2014, Giroud had to apologize to his wife for the incident reported about him cheating his wife with model Celia Kay. In 2013, a French charity calendar featuring naked sportsmen sold for charity, Dieux du Stade, featured stripped naked Giroud in their cover. Giroud was voted the Hottest Premier League Player in February 2015. Giroud takes David Beckham as his inspiration for his style. The 32 years old French striker stands tall with a height of 1.93 m ie six feet four inches tall. He has an athletic body build and has managed to maintain his body perfectly fit. As of 2018, the net worth of French footballer is estimated at around $10 million. Giroud has earned million dollars of fortune as a successful striker. He has spent a successful career in all the clubs Grenoble, Istres, Tours, Arsenal, and Chelsea. Arsenal signed Giroud in June 2012 for a transfer fee reported to be around 12.4 million Euro. In 2014, Giroud became the face of Hugo Boss's Boss Bottled men's fragrance. Giroud has endorsed Puma since 2009. He also has a sponsorship deal with Carlsberg.